Dad’s Halo Effect is a major new public sculpture in East Manchester by renowned contemporary artist Ryan Gander. 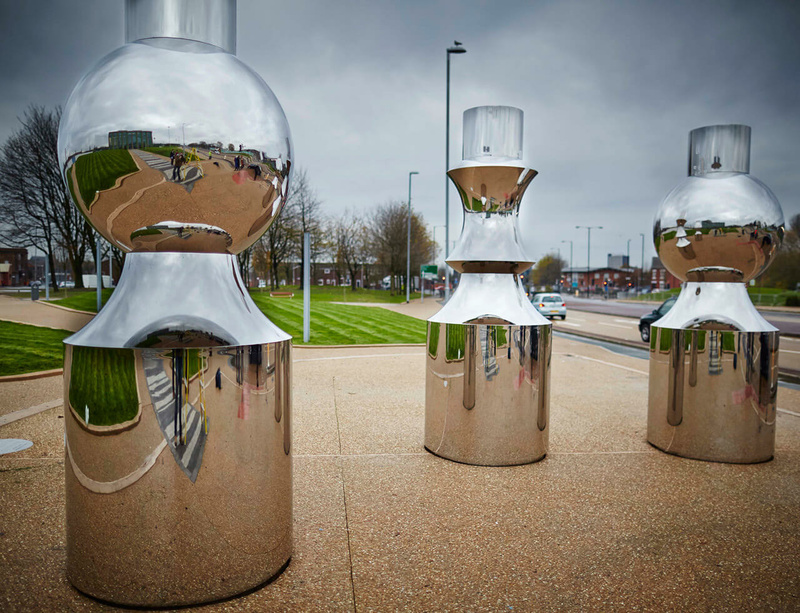 Installed as the centrepiece to the Beswick community hub regeneration project in East of the city, this work is based on an idea described to Gander by his father. Dad’s Halo Effect is composed of three, 3-metre, polished stainless steel sculptures that represent chess pieces in a checkmate position. Yet, because they are all made from the same material in the same colour, it is impossible to tell which of the fictional opposing players are in the lead. The idea for the sculpture was conceived while the artist’s father who worked for General Motors, and its forms will be based on parts of the steering mechanism of a commercial Bedford truck, signalling the tradition of heavy industry in the local area.This public sculpture is being installed as the centrepiece to the Beswick community hub regeneration project, sitting alongside the newly opened Connell Sixth Form College and the new East Manchester Leisure Centre.